Yet another fan girl moment for the lucky Filipina singer! 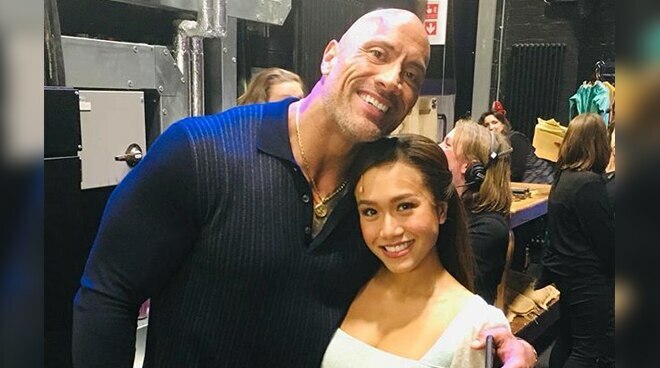 Rachelle Ann Go is ecstatic to have met another big name in Hollywood, actor Dwayne Johnson or popularly perceived in his industry as “The Rock”, after a successful play in London just recently. Currently, the Filipina singer is among the cast of internationally acclaimed broadway play, Hamilton the Musical, as Elizabeth Schuyler Hamilton. “The ROCK! Oh man! He is so cool! Thank you for the lovely words, [The Rock]”, wrote Rachelle on Instagram last Thursday. It was in January last year when the 32-year-old star confirmed that she has been casted in the West-end production of the play, after her successful stint in the 2014 remake of Miss Saigon. Aside from The Rock, Rachelle was also lucky enough to have met other Hollywood actors, including Claire Foy, Benedict Cumberbatch, Keira Knightly, and Emma Stone, to name a few.